Modern Mormon Men: Saltair, Why Do You Give Me The Creeps? Saltair, Why Do You Give Me The Creeps? Like many a good Mormon, I spent some time in and around Salt Lake City. I haven't been back though for more than seven years. What's keeping me away you might ask? 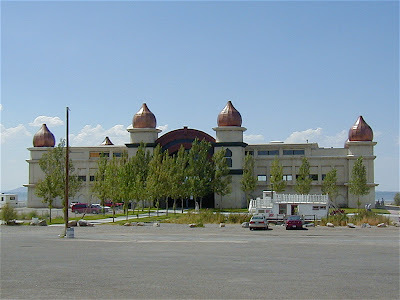 Well, one thing is the Saltair Pavillion. That mysterious palace of salt sends chills down my spine. Now, I'm not normally a fearful person, so the effect that edifice has on me is a bit mysterious. It periodically haunts my thoughts even though I've never been there, just drove past it a few times as a teenager. The 3rd incarnation is much less grand than the first. Here's a video made by a Saltair security guard. Notice what he says at minute 9:00. MMM readers, have any of you been there (did you 'get sleazy' perhaps)? It could be that my fears are unfounded and it is a delightful place. 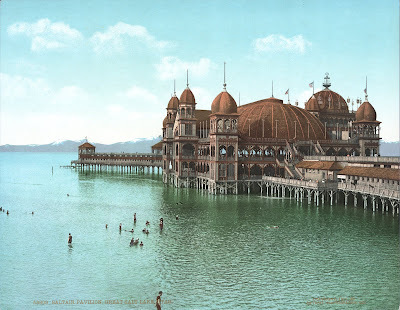 Odd, though, that Saltair pops up in my mind from time to time like it's the house of usher.